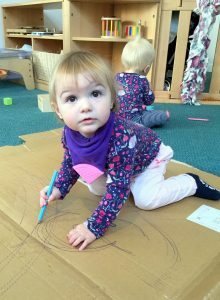 All the Rooms in the Nursery have been filled with creativity, productivity and laughter over recent weeks. 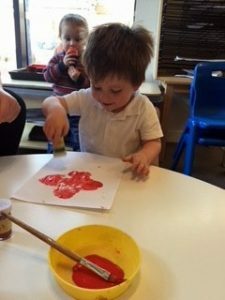 It has been lovely to see the children’s work displayed all around the Nursery. Now attention is clearly moving towards preparation for Christmas and glitter is everywhere! It is wonderful to hear the children learning to sign and sing their Christmas songs for the upcoming Christmas production, details of which are in this Newsletter. I am sure that you are looking forward to this event as much as I am! 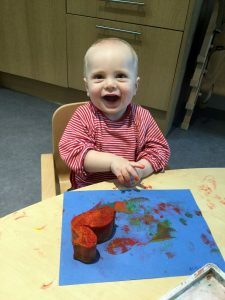 This month in Foals 1, we have been exploring mark making using a variety of tools and surfaces such as pencils, paints and sponges. We used our gross-motor skills for a giant picture on cardboard. 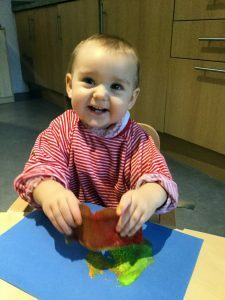 The babies had lots of fun engaging and using their senses in different activities. 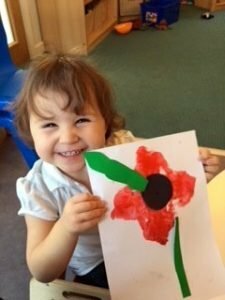 We have been learning about Remembrance Day in Foals 2, we watched a lovely video from CBeebies aimed at very young children. 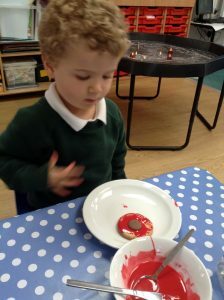 We then spoke about the rabbits and the poppies in the video whilst doing our painting. We have also created a big group firework painting which the children are very proud of and enjoyed showing it off to parents at the end of the day. 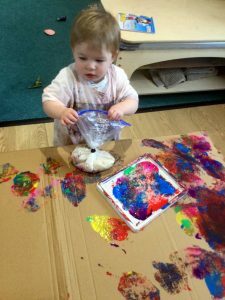 We experimented with bags of rice to ‘splodge’ the paint to make the fireworks and create different textures. 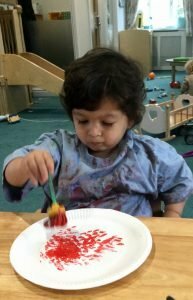 The children were saying “pop” and “bang” while painting, copying sounds and developing their communication skills. 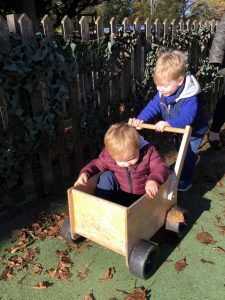 The children have also enjoyed playing in the Autumn sunshine with their friends! 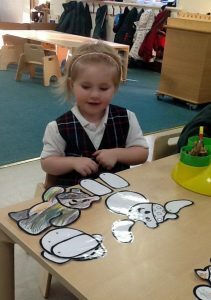 In Yearlings, the children have been enjoying taking part in craft activities for different recent occasions. 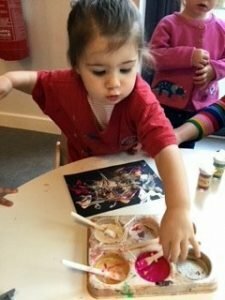 For Bonfire Night, the children made some glittery firework paintings and we spoke about firework safety during our ‘welcome time’. The Yearlings have also learnt about Remembrance Day and how people keep us safe. 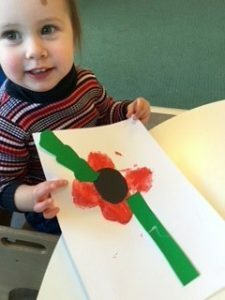 The children showed their respect and appreciation by making some hand printed poppies. 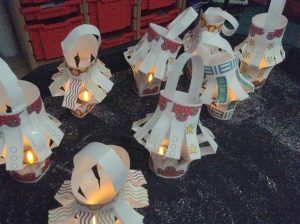 In Ponies 1 we have had a busy few weeks of special events – Autumn celebrations, bonfire night, and Diwali. This week we have been talking about Children in Need and how Pudsey the Bear helps raise money to help children who are like us but not lucky enough to have all the things we have. 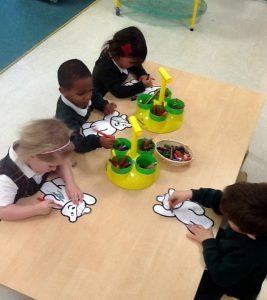 We have done some Pudsey-related activities such as mark-making our very own Pudsey bears and using our problem solving skills to put a Pudsey puzzle together. Ponies 2 have also had a busy few weeks of celebrations! 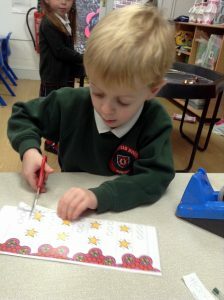 Here you can see us developing our cutting skills to make lanterns for Diwali, and making poppy biscuits to remember people who have kept us safe. 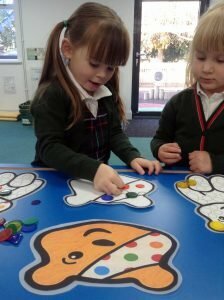 In the last few days we have had a few Children in Need activities, including some colour and shape matching and counting spots on Pudsey’s eye patch. You are all very welcome to join our Little Foals music group, which is held in the Performing Arts Centre from 2.00pm – 3.00pm on Fridays during term-time. Please do tell your friends! Please could you ensure that all your child’s items of clothing are clearly labelled, including their hats, gloves, and scarves. Please could we also request that you check that your child has not mistakenly brought home another child’s clothes. Thank you. 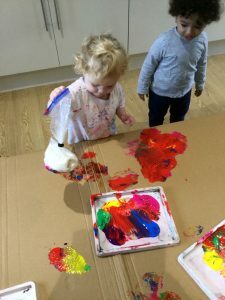 If your child will not be attending Nursery, either because of ill health or for any other reason, please could you ensure that you let the Nursery know by half past nine that morning. 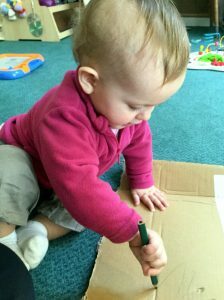 We are obliged for safeguarding reasons to contact you if your child does not attend Nursery when expected. Thank you for your understanding. 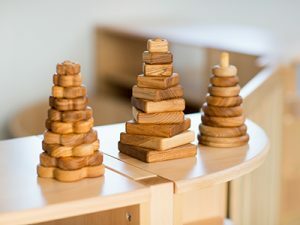 If your child attends the Nursery on a term-time only basis, please note that Fairstead House’s term finishes for Christmas at 12.00pm on Friday 14th December. 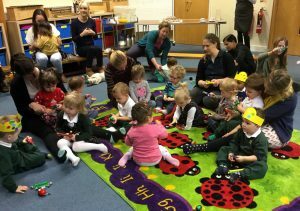 If you would like your child to attend Nursery that afternoon or for any other sessions over the Christmas holiday, please contact the Nursery to check availability. Our term dates may be found on the Nursery website here. The Nursery is closed for the Christmas break from Monday 24th December to Tuesday 1st January inclusive. We re-open on Wednesday 2nd January 2019 and term begins on Monday 7th January. We are delighted to announce that our Nursery Christmas Celebration will take place in the Performing Arts on Friday 7th December at 3.00pm. You will shortly receive your invitation, which also lets you know the part your child will play in the performance. Please note that, due to the limited space in the Performing Arts Centre, an absolute maximum of two tickets per family will be available. The doors to the Performing Arts Centre will open at 2.15pm and mulled wine and mince pies will be served in the foyer. Please note that there will be no space for pushchairs inside the foyer and, unfortunately, parking will not be available on site. Many thanks for your understanding and I look forward to seeing you there.